Secret Course 21 is the twenty-first secret course that appears in the Remix 10 mode of Super Mario Run. This secret course takes place in the sky. This course is made up mostly of Hard Blocks. 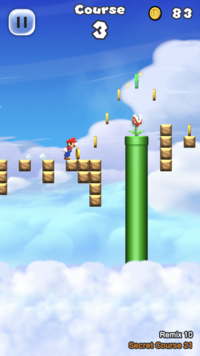 Most of the gaps between the blocks are one or two blocks wide, so Mario can run over them without jumping. At the beginning, a ? Block containing a Super Mushroom can be found. The first Bonus Medal is above the first Piranha Plant. After this are more Hard Blocks and the second Bonus Medal above a second Piranha Plant. After this, the player goes down a "staircase" of Hard Blocks. Halfway down the staircase, a ? Block with a Super Star appears. At the bottom, a ? Block with the third Bonus Medal inside it can be found. After that, the fourth Bonus Medal is found above more Hard Blocks and the fifth and final Bonus Medal is immediately after this below the last Hard Block. A set of six Springboards is right before the Goal Pole. This page was last edited on March 10, 2019, at 15:38.